The GSBLSU graduating class of 2014 convened on June 6, 2014 to celebrate and commemorate the three years of dedicated education and camaraderie with their fellow classmates. We have gathered some photos from the event and included them here for all to enjoy! 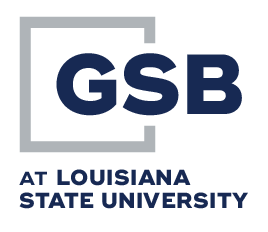 The Graduate School of Banking was founded in 1950 by a small group of bankers, lead by Mississippi Banker Orrin Swayze, from the First National Bank of Jackson, and several executives of state banker associations. Rejected by several universities as hosts, the school was accepted by LSU and 99 bankers arrived at the un-air conditioned Hatcher Hall on campus in August, 1950 to begin their professional education. The founders very early established a “learning environment” for the school which was challenging because of the “convention environment” the industry was accustomed to. Mandatory class attendance, examinations, home work, and academic discipline became hallmarks of the school, a tradition which has been maintained through its history. Originally sponsored by nine southern banker associations, endorsement of the school grew very rapidly to fifteen associations. Over 15,000 bankers have graduated from the program and virtually every bank in the sponsoring states has a senior officer who proudly displays a school diploma on the office wall.